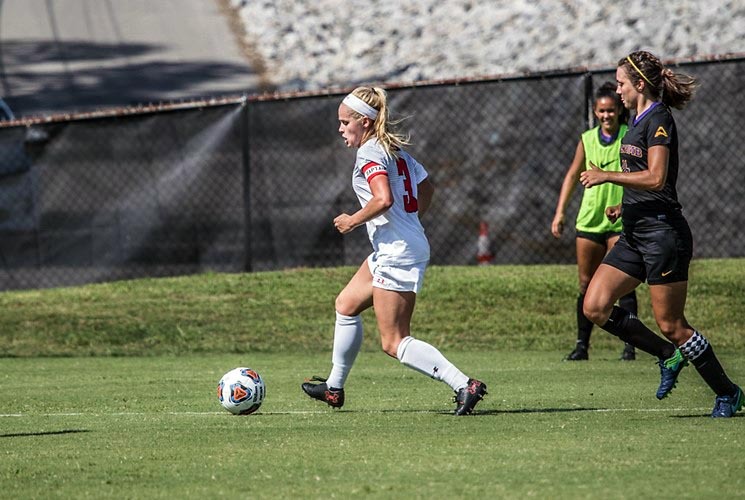 Clarksville, TN – Kirstin Robertson‘s 53rd-minute goal was all Austin Peay State University women’s soccer needed to run its winning streak to three, with the Governors topping Lipscomb, 1-0, at Morgan Brothers Soccer Field, Sunday afternoon. With the win, Austin Peay has now won three of four to start the 2017 campaign—the second consecutive year the Governors have won three of their first four contests. Although possession was there in the attacking end for Austin Peay in the first half, the Governors did not pester Lipscomb with shots early, attempting just three in the opening 45 minutes. Meanwhile, the Bisons counter-attack led to seven first-half shots, including an early Jade Abarca attempt which was stopped by Mary Parker Powell and a 19th-minute shot from Natalie Duboise that saw her run unabated and fire from just outside the 18-yard box; fortunately for the Governors, Duboise’s attempt hit the cross bar and was cleared away. Austin Peay’s lone first-half attempt on frame was a laser from freshman Jade Dauriat, who squared up from 30 yards away and forced a leaping save from Lipscomb’s Kate Mason. In the second half, Austin Peay’s offense roared to life, peppering the Lipscomb side with 11 shots and forcing six saves. Much of that was due to the presence of Robertson, a fixture in the Lipscomb third for much of the match. She led all players with five shots (three on goal) and the game’s lone goal. Less than eight minutes into the second period, she collected a Claire Larose pass, beat her marker and chipped the ball over the keeper’s head and in for her season’s third goal in four games. As the match neared its conclusion, Lipscomb stepped up its attack. In the 82nd minute, Brooke Brenner’s strike was turned aside by Powell, preserving the win and the first clean sheet of Powell’s APSU career. Austin Peay is on its first three-match winning streak since Sept. 18-30, 2016 (Chattanooga, Morehead State and UT Martin). Robertson now has 17 goals in her Austin Peay career—12 behind recently-departed Governor Gina Fabbro for third all-time. After scoring in three straight matches to open the 2016 season, Robertson has now scored in three of four to open 2017. She’s the eighth Governor to score three goals in the season’s first four matches, joining Fabbro (2016), Tatiana Ariza (2011, 2013), Emily Perkins (2011), Claire Pultz (2011), Emily Kink (2010), Jessica Hosse (2005) and Erica Dengler (2005). Iron Wills: Dauriat and Renee Semaan have played all 371 minutes of the 2017 season.